Oregon armed wildlife refuge armed occupation: Four remain. 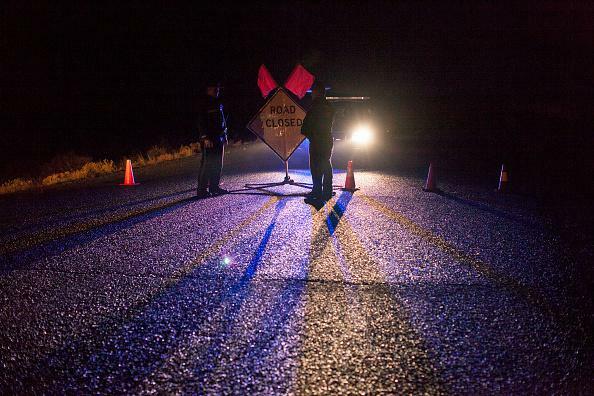 Oregon state troopers at a roadblock near the Malheur National Wildlife Refuge on Jan. 28, 2016. Only four armed occupiers remain on the Malheur Wildlife Refuge in Oregon, the Oregonian reports. Eleven individuals associated with the anti-government takeover of the refuge have been arrested this week and authorities have allowed a number of others to leave the area without being apprehended. An estimated 40 people were believed to be at the site when officials began setting up roadblocks around it and making arrests on Tuesday. Fry said in his video feed posted early Thursday that the group was willing to leave but had been told that Sean Anderson would be arrested on a felony warrant. … [Anderson] has an outstanding bench warrant related to an August 2014 arrest. Anderson was charged with resisting an officer, possession of THC and possession of drug paraphernalia, all misdemeanors. Wisconsin court records show Anderson was convicted of misdemeanor disorderly conduct in 1998, 2008 and 2009. He was convicted of criminal trespassing in 2002. Seems like it might be tough for him to wriggle out of this one. The law under which the arrested Oregon occupiers have been charged, incidentally, was originally passed in order to prosecute Confederate secessionists and sympathizers for interfering with the operation of the federal government. The maximum penalty for the charge is six years in prison. The others traveling with Finicum were arrested.